Ever since my visit to Thailand in February I’ve been completely hooked on mango sticky rice. For those of you not familiar with this dish, I have to tell you that you haven’t lived until you’ve tried it. It’s basically a ball of sticky rice served with sliced mango and a coconut sauce, sprinkled with some sesame seeds. Ok, so it doesn’t sound like much. In fact it sounds pretty awful having just read that back. But the textures are so good and that coconut sauce. Wow. Salty and sweet and coconutty at the same time. It’s just divine. I’ve been trying to recreate it ever since we got back. Now it’s fair to say I don’t have a good history with cooking rice. In fact, my track record is so bad that I’ve had to run out and buy take away rice during dinner parties on several occasions. Basmati rice turns into mush at the very sight of me. I have improved (my smoked haddock pilaf being testament to this) but I’m still pretty inept. So my efforts at producing a batch of mango sticky rice have been disappointing to say the least. My first effort wasn’t sticky at all. The second batch wasn’t really cooked but looked slightly burnt (I have no idea how! ), the third batch was sticky but mushy too. You get the picture. So, with great sadness, I have given up my quest for home-made mango sticky rice. BUT, this rice for dessert concept has made me realise my life long hatred of rice pudding is no longer with me. 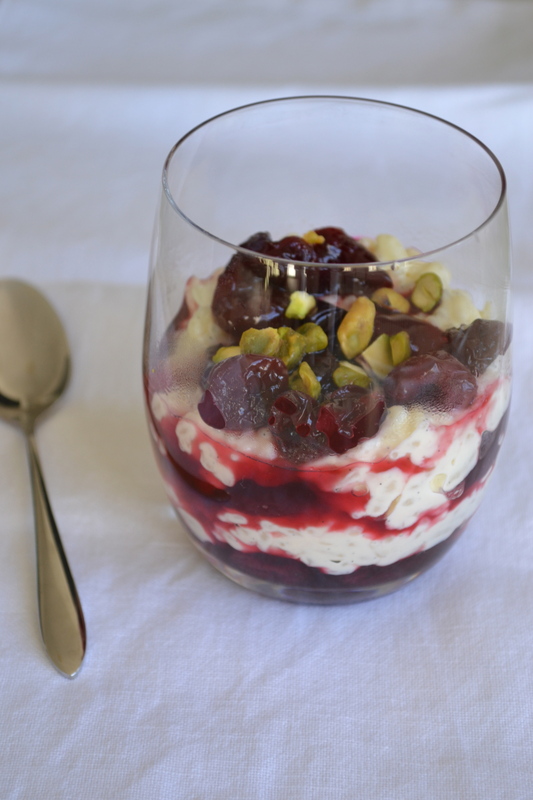 Cue Ottolenghi’s Cinnamon Rice Pudding with Cherry Compote and Pistachios. I saw him make this on his TV show a year or so ago and at the time thought it sounded awful. But with my new-found love of rice based desserts, it suddenly started to sound rather appealing. You infuse a mixture of cream and milk with a vanilla pod and some cinnamon sticks (organisation needed here: the longer you infuse it for the better, ideally overnight). This is what you cook your rice in to produce a wonderfully rich, thick and fragrant pudding. The pudding is layered up with a cherry compote, which works really well with the creaminess of the rice. Add a flourish of crushed pistachios to the top and you’ve got a delightfully decadent dessert that looks absolutely beautiful too. 1. Put the milk, cream, vanilla (pod and seeds), cinnamon and 2 tablespoons of caster sugar into a medium saucepan and place on a high heat. As soon as the mix is about to reach boiling point, remove it and allow it to cool. Leave to infuse in the fridge for at least an hour or overnight if possible. 2. 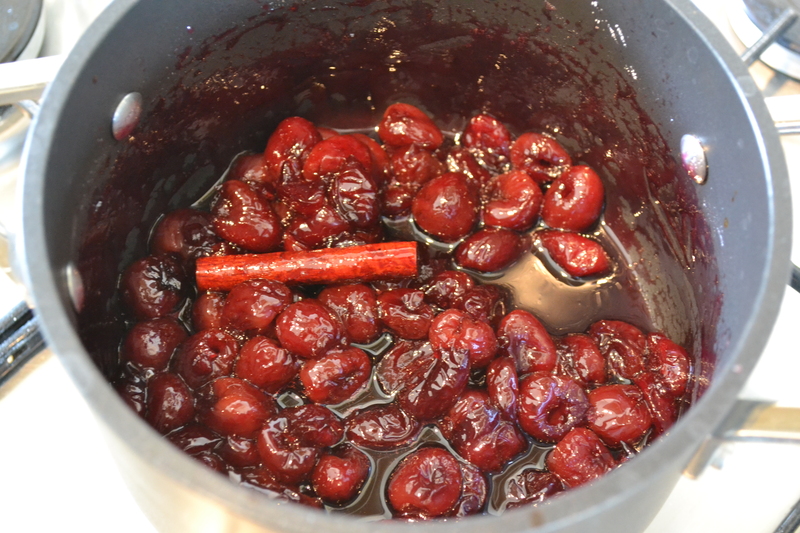 To make the compote: Place the cherries, sugar, cinnamon stick, lemon juice and rose water in a medium saucepan and stir. Cook over a medium heat for about 20 minutes. The compote should have a thick, jammy consistency. Set aside to cool. 3. When you’re ready to make the rice pudding, bring the infused milk and cream back to the boil (don’t worry if a skin has formed, this will blend into the pudding) and add the rice. Cook over a medium heat for about 20 minutes, stirring frequently. The rice should be cooked through but not be mushy and the pudding should be thick. If it gets too thick/dry before the rice has cooked, add a little water (about 50ml). 4. When the rice is cooked, remove from the heat and carefully remove the vanilla pod and cinnamon sticks. Stir through a pinch of salt and, if using, the rose water. 5. 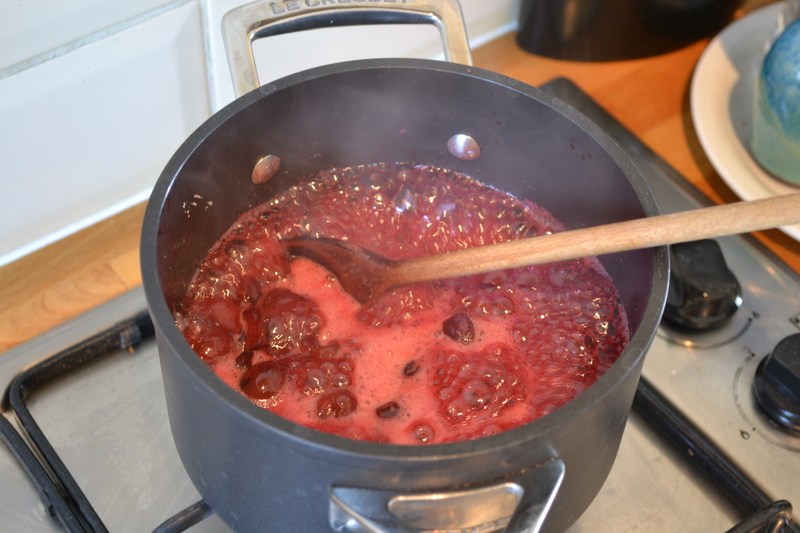 Place some of the cooled compote into individual bowls or glasses and spoon over some rice to cover. Repeat with more cherries and rice. 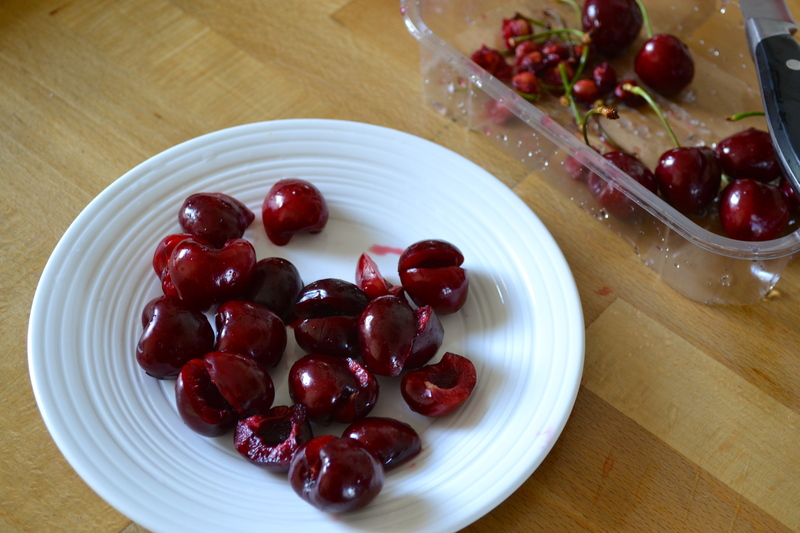 Finish with a spoonful of cherries and a sprinkle of pistachios. Serve immediately. If you don’t serve the rice immediately it will become very thick and congealed. As a result this isn’t a dish to be eaten cold. If you make the rice in advance though you can return it to its former glory by heating it back up with the addition of a little boiling water. Stir gently to loosen the rice then eat immediately with the compote. I love mango sticky rice! This rice pudding sounds so lovely I must make it. It’s a shame you have such a battle with rice! Hope you win that battle soon. Thanks! I hope so too – I think a rice steamer could be the answer but I just don’t have enough space in my kitchen to justify it! !